Hey all! Since Flutter run's user code and provides a wireless connection using the same board, it's a great low cost platform for building drones. As such, I've started working on some drone code using a chassis from Game of Drones, a cheap chinese IMU (MPU-6050 board), a Flutter Basic, and an Explorer board. Of course control is provided by the awesome Remote Control board we sell. I've got all the controls working and I am hacking up someone's drone code from the web, but it's still not working properly. The code is posted on github. If anyone wants to fully own this and make it fly, I can provide all necessary hardware. If you've ever built a drone from scratch using Arduino, please say so here and let's get talking! I have a quad flying using my own derivative of this code running in an ArduPilot with stability, baro pressure, GPS, battery monitoring etc. Am just waiting on my 5 Flutter boards so I can implement a whole lot more functionality. What is your timeframe for development? Hey, this sounds great. What gyro do you guys recommend? The MPU-6050 is kinda lame from what I hear. Is there one that works over SPI instead of I2C? Something 9 axis would be nice. I can spin a custom drone shield with room to mount an IMU, so they don't have to be hand-wired. Then I can hook you guys up with those. We'll ship all your boards in about 2 months, which is enough time for me to get some prototype drone shields back too. 6-axis is definitely necessary I'd say (gyro and accelerometer), but why magnetic field/air pressure? Sure, you can use air pressure to help determine altitude, but it's highly dependent on weather and the longer the flight time the more likely that data is going to become skewed. For cost reasons, 6 axis would probably be sufficient. Bonus points though for making it plug-and-play, and having the option to simple say which one you're using in the code, unplug one module and plug the other in. Same with GPS if we do end up going that route... not having it included but having a spot to plug one in if desired is a great way to help break down the cost for those just looking for a cheap stabilization unit. I've used the KK Multicopter 1.3 board a bit, which only has 3-axis gyro, and it's quite a bit more difficult to fly then something that incorporates accelerometers as well, but only costs like $12. Never had a problem with the MPU-6050 myself, works well for me. I use a GY-273 3 axis magnetometer for heading/pointing and BMP180 for air pressure measurement for differential altitude. Having them separate means I can keep the MPU as close to the CG as possible, the 273 as far away from the noisy electronics like the motors and speed controls as possible and the BMP tucked away out of any prop wash/airflow. Usually stick the 273 on my GPS mast for best clearance. BMP is often near the rest of the electronics. I have custom build quads/hexs that need more flexibility than most people, but I also find that it's actually cheaper than the all in ones too. Using GPS alone for altitude is too inaccurate and has a lot more drift than air pressure. I use a combination of both to try and minimize drift and reduce signal noise for a more stable altitude hold hover. Works quite well when most flight times are less than 20 mins. Does a reset if you land and then take off again too. Silly me.... hadn't realized 'magnetic field' could be a reference to a heading/compass..... gah. So, all three are best for accuracy, but maybe in different modules so that they can not be effected by other electronics. 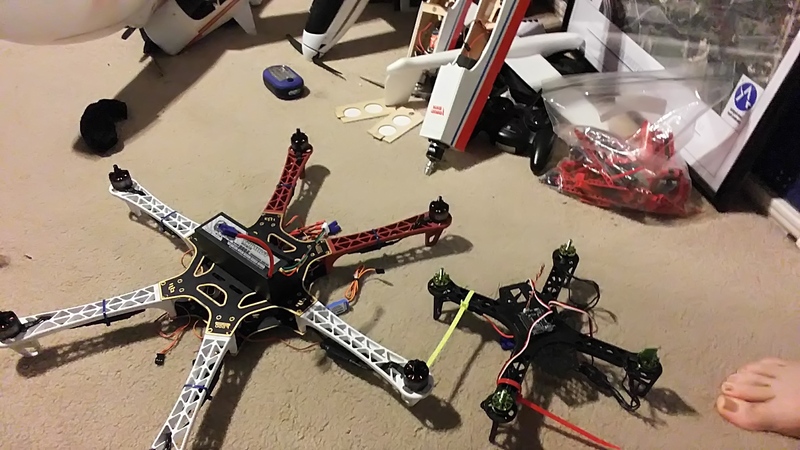 I've never built a quad with any sort of custom software on it, so this is incredibly interesting.